Hearts travel north to the Granite City hoping to set a new club record of six consecutive clean sheets when they take on Aberdeen. That won’t be easy, however, with the Dons having scored ten goals in their last six games and Hearts possibly without four players who appeared in Wednesday night’s derby draw with rivals Hibs. 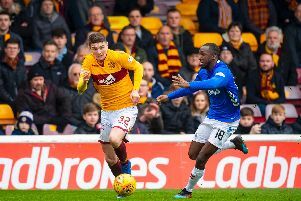 Prince Buaben twinged his groin against Hibs while Jamie Walker is struggling with a knee injury. Ross Callachan and Rafal Grzelak are also doubtful for the trip to the north east while Connor Randall is nursing a broken hand. Arnaud Djoum (knee) and Lewis Moore (calf) also miss out, leaving Craig Levein with the bare bones of a squad to choose from. Michael Smith missed the derby with a back problem but could return to the squad tomorrow. Aaron Hughes, who replaced Randall on Wednesday night, could start at right back if Smith doesn’t make it. Hearts will, however, be boosted by the return of Harry Cochrane after he missed the visit of Hibs through suspension. Aberdeen are likely to have a full squad to choose from with the exception of Stevie May, who is still out with a leg injury, and Greg Tansey. Niall McGinn, who signed a three-and-a-half year deal with the Dons earlier this week, doesn’t join until January 1 so won’t be part of proceedings. Nicky Maynard returns from illness while Andrew Considine and Greg Stewart should recover from knocks picked up in the 1-0 win over Partick Thistle on Wednesday. Last five meetings: Hearts 0-0 Aberdeen; Hearts 1-2 Aberdeen; Aberdeen 2-0 Hearts; Hearts 0-1 Aberdeen; Aberdeen 0-0 Hearts; Aberdeen 0-1 Hearts. Likely Aberdeen team (4-2-3-1): Lewis; Logan, O’Connor, McKenna, Considine; Shinnie, McLean; Stewart, Christie, Mackay-Steven; Rooney. Subs from: Rogers, Harvie, Ball, Reynolds, Arnason, Wright, Ross, Maynard.